Collins Booksellers - "How to NOT Get Scammed or Ripped Off When Hiring a CCTV Installer or Buying a System for Your Home" by John K David, 9781311747648. Buy this book online. My name is JK and I have been involved in the CCTV business since July 2003. I began working for a small company in Mansfield, OH and I have installed CCTV systems all over Ohio, parts of Indiana, North Carolina and northern Florida. I’ve worked with Laundromats, retailers, recycling/trash collection companies, bars and nightclubs, c-stores, gas stations, car washes, car lots, trucking companies, water treatment plants, restaurants, hi-rise condos, factories, the local BMV...you name it. One of the biggest issues I’ve found is that MOST people-consumers, small business owners, managers, law enforcement, CEOs, Loss Prevention Personnel and homeowners-have NO IDEA what the difference between a good, great or junk video security system really is. Another major problem with most video security products today is that you can buy them everywhere and they’re cheap. So, everybody sees these low-cost “CCTV systems in a box” at Lowe’s or Sam’s or on Ebay and think these systems will do the job. 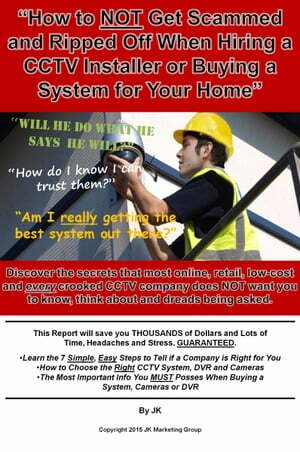 My ebook report will show you how to buy the right system or hire the right installer to do the job.